CIPA's UTV Passenger Side Mount Rearview Mirror clamps onto the passenger (right) side of roll-cage bars of UTVs to provide vision when and where it is needed. 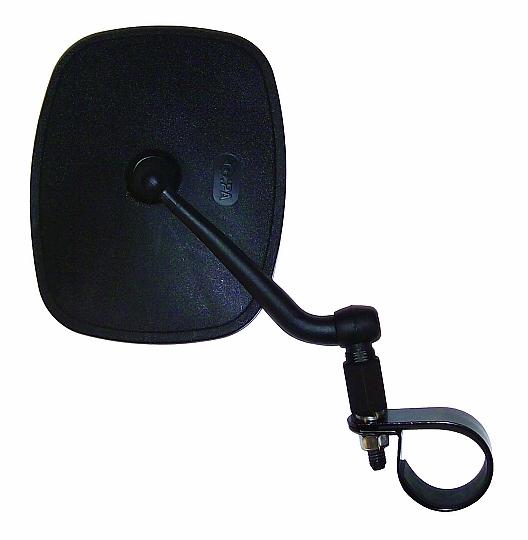 Large 5 x 6.5 inch adjustable mirror head provides superior visibility that is crisp and clear. OEM grade 2MM flat chrome lens ensures a high quality reflective surface in any weather condition for many years to come. The sturdy aluminum metal bracket along with the ball and socket adjustment design reduces vibration, and keeps the mirror where it is placed - even on the most rigorous of trails. The UTV Passenger Side Mount Rearview Mirror features a nylon fiber arm and aluminum hardware ensuring a lightweight design. Fits roll-cage bars 1.75 inches in diameter. Each kit contains 1 passenger side (right hand) mirror assembly, 1 aluminum bar clamp, 1 machined mount, 2 lock washers, and 1 aluminum adjusting nut.